Cinco de Wednesday: 5 Start Points for Becoming an Idea Machine! I recently came across a blog post by James Altucher that addresses [the issue of mental wellness]. In it, Altucher notes that “if you don’t exercise your ‘idea muscle’ every day it [will] atrophy and you [will] lose the ability to be creative.” Altucher’s proactive solution to this conundrum was to begin writing ten ideas every day. 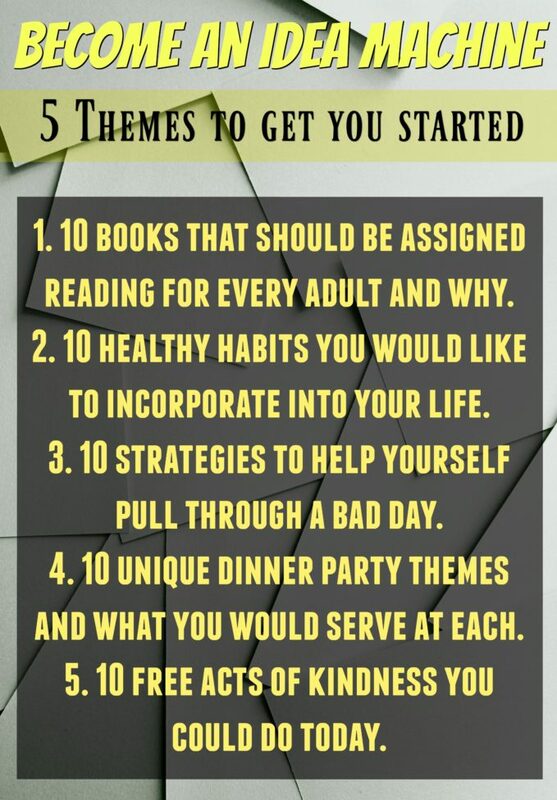 The process is simple (if not easy): each day, he chooses a theme and then lists ten ideas to fit it. . . . The themes can range from quirky to practical, but the goal isn’t to develop great ideas—the goal is to give one’s mind a bit of daily exertion. Altucher admits that most of his ideas are bad ones, and few are taken any further than the notes on his page, but his daily practice keeps his mind limber and helps satisfy the mental component of staying holistically healthy. Inspired by Altucher, I decided to incorporate this practice into my own daily routines. 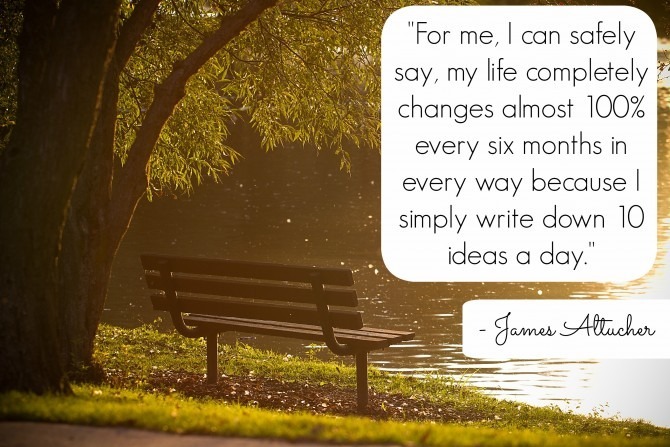 For the first few months, I generated ideas based on my own themes, and late last year I started working my way through the daily prompts in Become An Idea Machine: Because Ideas Are The Currency Of The 21st Century, which was written by James’s wife, Claudia. When I first began generating ideas, I thought it might be a passing fad. But the habit has stuck, and I don’t see myself stopping any time soon. Not only have I seen improvements in my creativity, but it’s also a lot of fun! There’s freedom in knowing nobody will see my ideas, which is a relief because most of them are pretty crazy. It’s also been helpful to remember that there is no need to act upon these ideas, although some have been the seeds for bigger ideas and personal calls to action—you just never know what can happen when you start becoming an Idea Machine! If you’re looking to enhance your creativity and gain mental prowess, I would strongly encourage you to give this practice a try. All you need is a piece of paper (or even just a new note on your computer or phone) and a few minutes to devote to your idea generation. Remember, you don’t need to share these ideas with anyone, so let your creativity run wild! Your ideas can be within any theme that is interesting to you, but to get you started, here are five themes for your first five days of becoming an Idea Machine. After your first five days, you might find that you want to keep going. If so, I recommend getting your hands on Claudia Altucher’s tutorial (the Kindle version is free for Amazon prime users!). And of course, I’d love to hear all about your journey of becoming an idea machine!